The German Christmas Stollen Recipe is prepared with yeast but without marzipan. It is not as dense as the traditional Stollen and more like a Stollen Bread. Mix the raisins and zante currant in a bowl, pour the rum over the fruit and let it soak overnight. Sift the flour into a mixing bowl and add sugar, yeast, and salt. Make a hole in the center of the flour mix to place the eggs and egg yolks in it. Grate the lemon peel on top of the eggs. Cover eggs and lemon zest with some of the flour and mix the ingredients. Melt the butter in the microwave and warm up the milk. 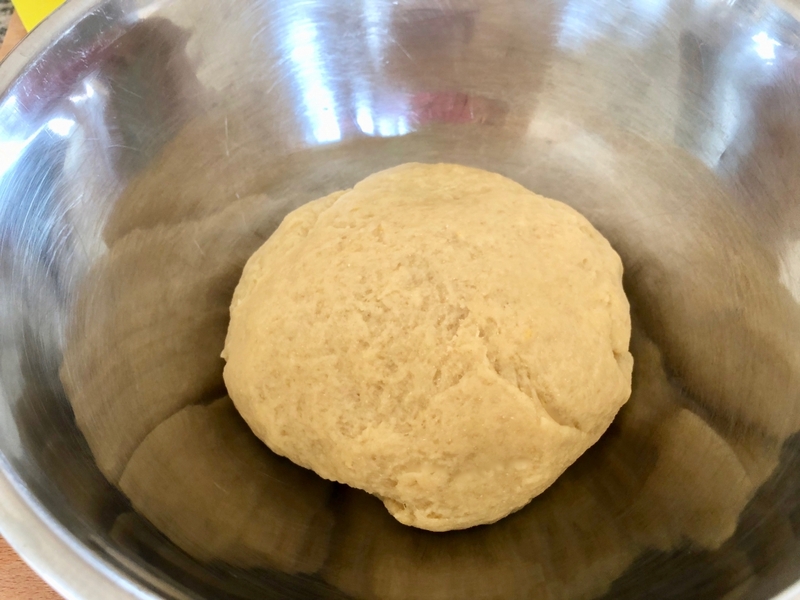 Add both one after another to the flour while constantly kneading with the kneading hook of a stand mixer or electric hand mixer until the ingredients are combined, and the dough is smooth. If needed continue kneading with the hands. 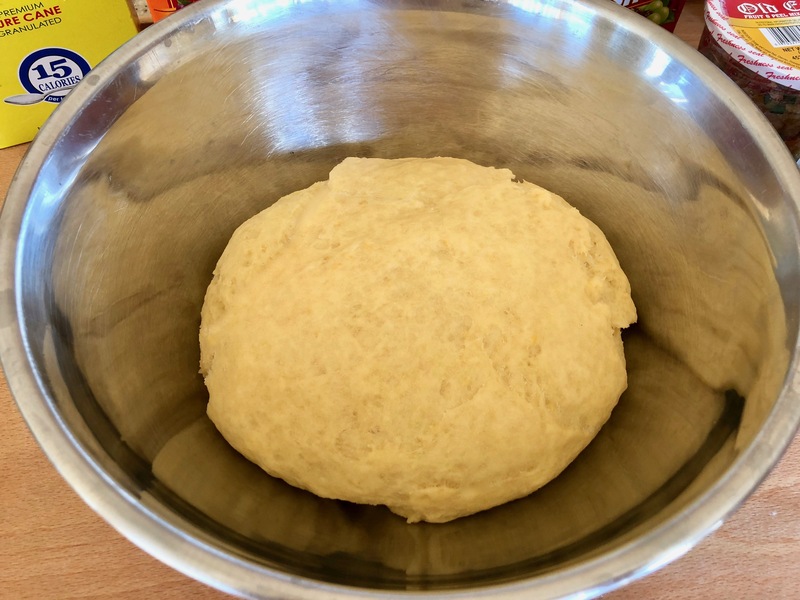 Cover the bowl with a kitchen towel and let the dough rise for 1-2 hours or until the dough has doubled. 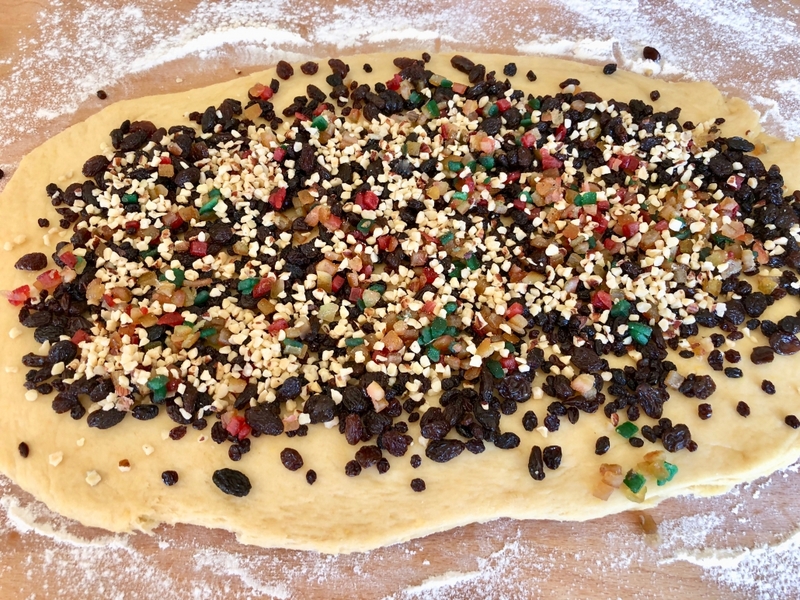 Roll the dough on a floured surface to a rectangle and spread the soaked fruit, candied fruit, and hazelnuts on top. Fold the dough so that the topping is inside and knead again. Cover a baking sheet with 2 layers of baking paper. Form an oval with the dough and shape it to a Stollen in the size of about 30cm x 12cm (11.8in – 4.72in). 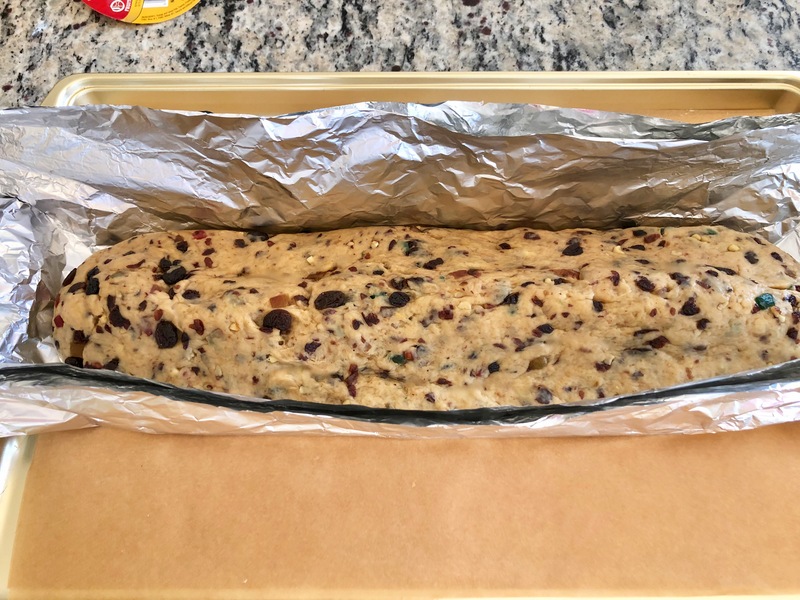 You also could use a stollen baking pan or loaf pan to shape the stollen. 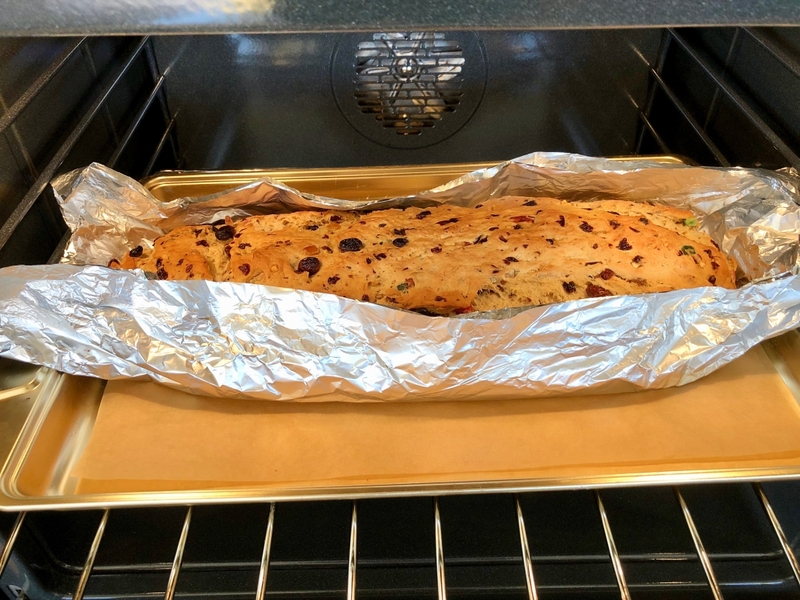 Place the Stollen on a double layered aluminum wrap and fold the sides up. 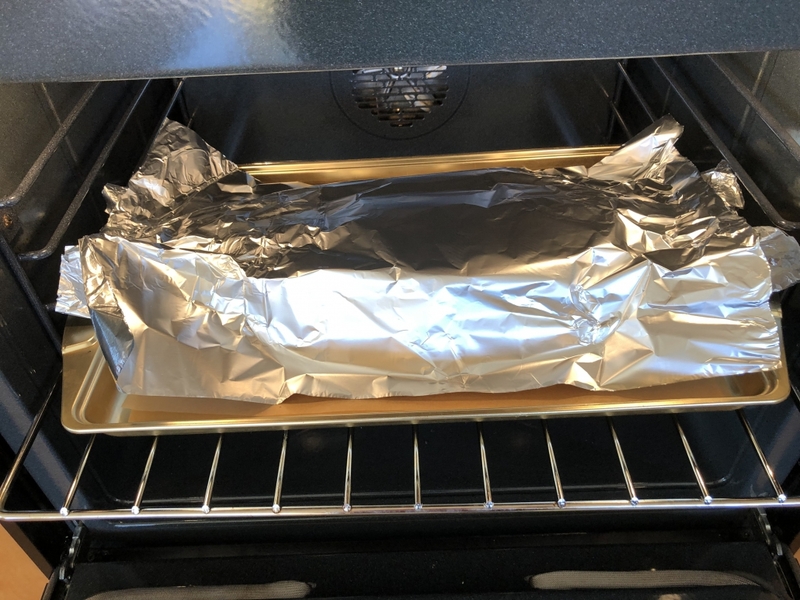 Transfer the Stollen with the aluminum foil onto the baking sheet. Let it rise for 20 minutes. Preheat the oven to 200°C (400°F). Place the stollen on the middle rack and back for 5-8 minutes. Turn the heat down to 180°C-355°F and bake for 45-50 more minutes. Cover the top of the stollen with an aluminum wrap for the last 15-20 minutes of baking time. Brush the hot Stollen with 70 g melted butter and sprinkle the half of the powdered sugar on it. After the stollen cooled down, sprinkle the rest of the powdered sugar on it. To store the German Christmas Stollen, wrap it in aluminum wrap and serve after three days. 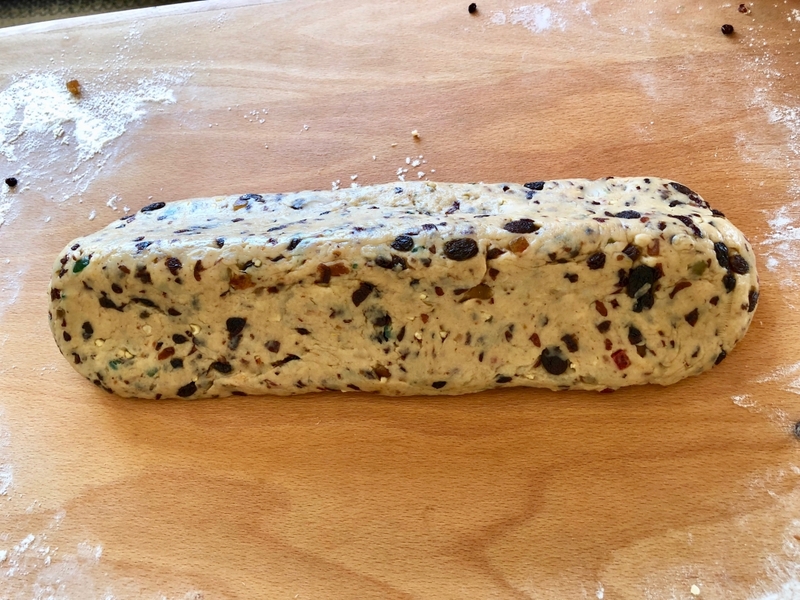 The stollen can be made ahead of time and frozen. To make the Marzipan Stollen click here, the German Quark Stollen Recipe click here, and the Christmas Stollen Recipe click here. German Honey Cake Recipe Homemade Breakfast Rolls, just the way they should be!